He does dry wall and plaster work. I had the walls of one of my apartments skimmed because they were "stucco" and dated. He did good work, quickly, and reasonably priced for the speed and quality. 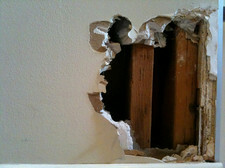 CAOD, when you say 'plaster work' does that also include redoing lathe and plaster walls? I have a wall that sustained water damage from leaking chimney flashing and would prefer to redo that portion of the wall (if that's even possible) rather than replacing the entire wall with drywall. Hello...are you still looking for a drywall company? I just came across your post. My husband and I just started a new company in Albany, The Drywall Man. Dan brings over 30 years of drywall experience to the table. He is a master! Please give us a call if you need help.